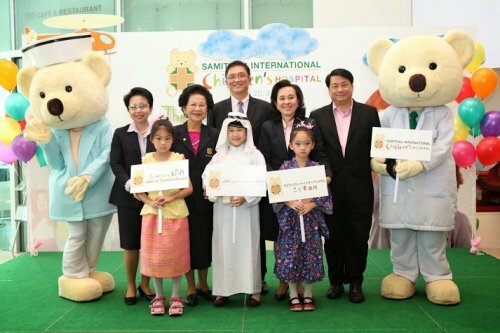 The Samitivej private hospital group has opened an international children’s hospital in Bangkok to serve up to 1,000 outpatients and 100 inpatients per day. The group targets annual revenue of nearly Bt1 billion from its new business, managing director and chief executive officer Dr Chairat Panthuraamphorn said. The opening is also part of its plan to become an Asian medical hub. Samitivej International Children’s Hospital is staffed by specialist paediatricians who cover all aspects of a child’s health. The hospital offers a full spectrum of primary and tertiary care services including paediatric air and ground medical transport to treat medical emergencies. In addition, Samitivej will continue its philanthropic efforts through its “New Life Foundation”, which will provide free paediatric heart surgeries and bone-marrow transplants for 10 children this year, Chairat said. He said Samitivej International Children’s Hospital would draw expertise from the group’s Sukhumvit and Srinakarin campuses. The company is expanding strategic alliances in Asean, Japan and the Middle East, and conducts continuous staff training to enhance service levels and constantly increase its potential and ability to take care of paediatric patients, he said. Samitivej says its strategy of combining the strength and synergy of all the hospitals in the group has been successful. The company generates revenue for the Thai economy and promote the development of Thai doctors through cooperation with overseas organisations for medical research, Chairat said. Dr Dhun Damrongsak, deputy CEO and director of Samitivej Hospital, said: “In addition to our strength in general and specialised healthcare, Samitivej specialises in providing paediatric medical evacuation and has been the only service provider of paediatric aero-medical transport services since 2007. All 130 patients who have been served by air ambulance have arrived safely at their destinations for medical treatments.